Anthony Wallace and I spoke today at Automotive High School, in Greenpoint, Brooklyn, to a ‘learning community’ that had spent several weeks reading and discussing Tim O’Brien’s Vietnam War novel, The Things We Carried. We were honored by the invitation. The Principal, Mrs. Lafergola-Stanczuk and her staff made us feel welcome, and the students were well behaved and well prepared. They even gave us both gift bags filled with a remarkable array of Automotive High School items, for which I am very grateful. The event took place in the auditorium. 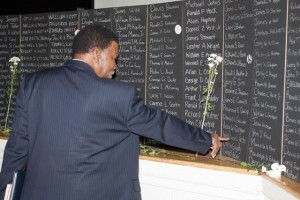 In preparation, students had created a replica of a fragment of the Vietnam Memorial Wall in Washington, DC. The students had taken care to place on their replica the names of Thurman Wolfe, Joseph DiGregorio and William DiSantis. These men were members of a squad Sgt. Wallace commanded as part of B Co, 2nd Bn, 7th Cavalry, 1st Cavalry Division, when he served in Vietnam in 1970. Wolfe, DiGregorio and DiSantis were killed. Wallace was wounded among the wounded. When he saw those names on the replica wall, Mr. Wallace offered them a military salute, as he does every time he reports for service as a National Park Service Yellow Hat at the Wall in Washington. After an introduction by Mrs. Lafergola-Stanczuk, I spoke for about five minutes in an effort to place Sgt. Wallace’s comments in context. I told the students about American casualties in Vietnam, gave them some factual information about their chances of being wounded, had they been an infantry soldier during the war years. Mr. Wallace followed, and told him of his personal experience. Easily the most interesting part of the event was the question-and-answer session. The students had clearly come prepared with questions to ask, based on their understanding of the Tim O’Brian novel. 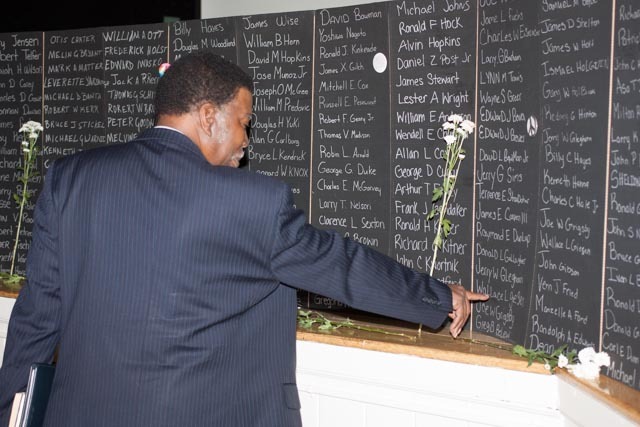 Students wanted to know if Mr. Wallace had experienced racism while in the American military, and whether or not he would serve again, given the opportunity to go back in time. He told them that as an African-American man, he well understood the special burdens American citizenship placed on people of color, but nevertheless believed then, and continues to think, that citizens have obligations to their nation. He told them that one reason he felt good about his service is that the American military at the time, in his opinion, offered rapid advancement to anyone, regardless of color, if they were proven capable. He reminded them that in order to become a noncommissioned officer he had to take tests and receive qualifying scores, and that once admitted to NCO school, he was evaluated according to a system that paid no attention to color, but rather competence. As a result, he graduated fifth in his class from NCO school. Students wanted to know about the psychological impact of service in Vietnam. One asked if he suffered from post traumatic stress, and another wondered if he suffered from “shell shock.” While he indicated he did not suffer from shell shock while in Vietnam, and continues to believe that he does not suffer from post traumatic stress disorder, he nevertheless acknowledges that other people have suggested that at least some of his behaviors, such as sleeplessness, could be related to PTSD. Because so much of the media image of the Vietnam War involves depictions of American military personnel killing civilians, students wanted to talk about that. He was asked if he had seen civilians and/or children killed. He said no; in Tay Ninh Province he saw almost no civilians at all. He did recount an incident in which he watched a young boy, perhaps 9 or 10 years old, disassemble and reassemble an America M-16 rifle in a fashion that suggested that the young man knew precisely what he was doing, just as a soldier might. Other questions circled around the issue of killing in combat. One individual asked about the personal items he carried while in Vietnam, and Mr. Wallace explained that, among other things, he carried his Holy Bible, and tried to read it as often as he could, sometimes by moonlight, and on other occasions under a tarpaulin, by flashlight. Given that, students were interested in the potential ethical and moral conflict between the Bible’s attitude toward killing and his obligations as a soldier. Mr. Wallace explained that as an American soldier in a combat situation, it was too late to worry about biblical injunctions against killing. At that time, he used his rifle as quickly and accurately as he could, because if he did not, the enemy surely would. The students were engaged enough to listen through two class periods, and we joined a small group of them for coffee and muffins in the principal’s conference room. We spoke with them briefly, and learned a little bit about their thoughts concerning the O’Brian novel. All in all, it was a privilege to be asked to visit Automotive, and Mr. Wallace and I would be delighted to do it again. This entry was posted in Bringing It All Back Home, events by Administrator. Bookmark the permalink.